Facing the prospect of a political bludgeoning Friday night in the first televised debate with Democrat Sen. Barack Obama, Republican Sen. John McCain has announced that he's "suspending" his campaign to work on the economy, and is requesting that the debate be delayed because of the current financial crisis. Seems like the real crisis lies within the McCain campaign. Senators this week have been debating the $700-billion bailout bill proposed by President Bush, Treasury Secretary Henry Paulson and Federal Reserve Chairman Ben Bernanke. But I'm not exactly sure what work McCain would be doing specifically, as he is not on the Banking Committee nor seems personally involved in solving the crisis. Sorry if I'm skeptical of McCain's altruism, but his motivation seems extremely self-serving. Hardly seems like a "Country First" maneuver. A new Washington Post/ABC News national poll released Wednesday shows Obama breaking away with a 9 point lead, 52%-43%, among likely voters. McCain led 49%-47% just two weeks ago. And with an eye on the current meltdown on Wall Street, the poll found that voters trust Obama by a 14-point margin to better handle the economy. I can't blame McCain. Given how voters view him and his party, I'm not sure I'd want to go before a national TV audience and discuss the economy either. In a prepared statement, McCain said: "It has become clear that no consensus has developed to support the administration's proposal. I do not believe that the plan on the table will pass as it currently stands, and we are running out of time. Tomorrow morning, I will suspend my campaign and return to Washington." Just exactly what "work" McCain would be doing in Washington this week that would preclude him from debating Obama Friday night is a mystery. The media should be demanding specifics as to his involvement. He should not be allowed this sanctimonious side-step that's designed to give him a presidential air while putting Obama on the spot. It simply seems like more of the same GOP framing, as in, "if you don't agree to postpone the debate you're against the American economy." Just wait. Should Obama refuse to postpone, we'll get a non-stop barrage of: "My friends, I'm sorry Sen. Obama has chosen to put his own personal political gain before the needs of the country and the American people." Obama must stand his ground, not fall prey to this phony posturing, and insist on holding the debate as planned. We don't need McCain in Washington. His Commerce Committee's years of deregulation is a major reason why we're in this mess in the first place. What we need is both candidates on that stage Friday night telling the American people how they're going to address the nation's mounting economic and foreign policy challenges. Both candidates made an effort to transcend the campaign today. At 8am this morning, Barack Obama called John McCain and asked that the two collaborate on a statement on the bailout. The call was not announced to the press. At 2:30pm, McCain called back and accepted. The initiative made sense: Without some unity from the two campaigns, some linkage of their fortunes, the two parties would be too paralyzed attempting to ratfuck each other to actually pass a bailout proposal. The statement, meant to remove the interests of the two presidential candidates, is forthcoming. ised the Obama campaign by going before the press and announcing a cessation of the campaign and a delay in the debate. There was no effort to plan a coordinated action with the other camp. Rather, he publicly demanded that Barack Obama follow suit. McCain promised that he would return to Washington to work on the bill. The drama of the negotiations will now be combined with the drama of the presidential campaign. The leadership structure of the Senate Republicans is suddenly unclear. No one quite knows what effect the presence of two presidential candidates -- and their attendant political incentives, media strategies, and advisers -- will have on the process. The contrast here is a clear one. Obama argued that the presidential candidates should recede into the background, agree on a common position and let Congress work without the impediment. It was a bipartisan stunt meant to construct a protected space for the congressional negotiations, where they could proceed without relative freedom from the presidential contest. McCain loudly proclaimed the need to set aside politics, focused cameras by demanding a suspension of the debates, and promised that both candidates would fully insert themselves and their entourages and their media power and their electoral interests into the negotiations. The McCain campaign has politicized the bailout debate even as it volubly denounces politics. It is astonishingly reckless. In that, it is par for the course. Whenever the polls turn, they seek comfort in chaos. They speak of the experience and seasoning needed for governance but pick Sarah Palin. They call for an end to politics amidst crucial congressional negotiations then fling the crush of the presidential campaign atop an already-delicate process. In their attempts to define themselves as above politics, they will politicize anything. Why not send Gov. Palin in his place for the foreign policy debate? She just met with Afghanistan's and Colombia's President? If she meets the head of the Alaskan meth lab syndicate she'll have covered all four major drug groups. Foreign policy and debating are Obama's two weak points and McCain was expected to win the debate. Why would McCain forfeit that advantage when his polls are low? Even before today's events all were saying he would probably recoup during the debate. In his speech today Obama said McCain mentioned postponing the debate. 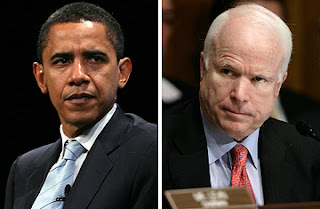 Obama claimed he had no idea McCain was saying he was not going to debate. I'd like to hear a tape of that early morning conversation. If this had been 9/11 there wouldn't be much either could do to help, but they would have canceled to go to the scene. No lives have been lost, but the danger this time is very real. this is a posturing stunt . If there is anyone who thinks McCain is going to fix the economy , I have a watch to sell you . Also , how come Bush isn't the one making this call ? Once again he gets a pass , as we are made to believe O bama is the weasel . i got 2 questions for everybody......1. what makes john mccain a hero ? and 2. who said john mccain is a foreign policy expert ? Bush has summoned Obama and McCain to DC tomorrow to discuss the financial disaster, so there is no longer any choice apparently for either one of them. Obama did not say "no" to the Prez. 7:57 He didn't say he would fix the economy. He said he'd work to get agreement so the plan can get passed. He is the top Republican and could get them to compromise. That in a sense would be "fixing" the economy. And to add insult to injury, McCain now wants to move the Presidential candidate debate to the date of the Vice Presidential debate, cancelling the eVP debate because it is so much more important for the nation to hear from the Presidential candidates. So, it is now more important for him to not debate now so he can be in Washington, where he claims not to be an insider, but it is later, at the exact time of the VP debate, that is the time for the Presidential debate. Country first ... Right John. Maybe McCain is just wanting to make sure he is there to get his share of the 700 BILLION dollar bailout money that they are going to split up. Maybe they are going to offer Obama a cut also. Who knows. All I can say is, To all the men out there that votes for Palin just because you think she is soooo pretty..., I dont want to hear you cry about the economy and how hard you have it after their party gets nominated because I will not feel sorry for you. On the other hand, we are probably screwed either way. Bailout? When you Bailout someone from jail do you ever see your money again? Who would come to YOUR BAILOUT? Has anyone thought about the interest that the FED is going to hit us with? I dont think the 700 Billion is the full extent of this so called Bailout. I also think that anyone who believes this will be the last Bailout is foolish. This kind of operation will never stop as long as the people will let it keep happening if we have a country left for it to happen to. Another stunt. Obama called him in the morning to work on a joint statement, McSneaky stalls until the afternoon, calls him back with a vague response, and then goes on the air with his drama queen dare. Shows what kind of diplomat he'll make. He wants credit for the outcome, is nervous about the debates because he's more comfortable in Town Hall Meetings. Reid didn't ask him to show up, he asked him for a statement of support. All right out of the Rove playbook. 7:42 You're wrong. Obama himself said when they talked McCain mentioned postponing the debate. Obama said he "didn't understand" that McCain was saying he wasn't going to debate, Obama has an "understanding" problem. He had no idea what Wright was saying from the pulpit all those years, either. The list of Democrats who profited from the financial setup is very long and frightening. Neither Party was looking out for us. It's unlikely that McCain was nervous about debating foreign policy with Obama, even though Obama has been undergoing a "Crash" cramming (a la Palin?) to be able to parrot lines from his advisers. Obama turned down the challenge because it presented too much opportunity for Obama to have to put details to his undefined "change" platform. Palin has nothing to worry about when it comes to debating Biden. She at least knows that Herbert Hoover, not Franklin Roosevelt, was in the White House when the stock market crashed in 1929. She also knows that there was no television in 1929. Again with the 10 townhall debates nonsense. McCain's townhall proposal consisted of handpicked and vetted audiences representing the Republican party faithful with loaded questions for Obama, and softball questions for McCain. Even if Ian's claims were true, what would prevent liberals from sneaking in like they did for the Republican Convention. Why should we believe that Obama will stand up to America's enemies if he couldn't face Ian's wild claims of a hand picked conservative audience ?